South Australia’s extremely dry climate and diverse range of water sources provide significant challenges to ensuring clean, healthy water for the State’s urban and rural communities. 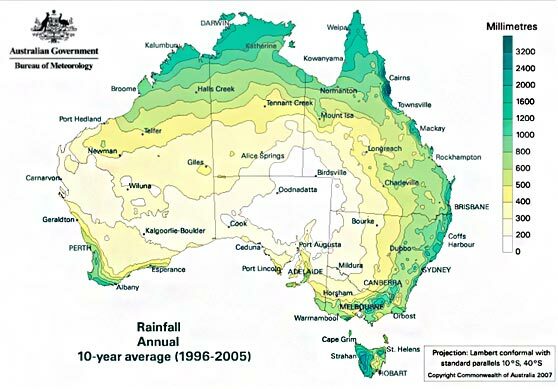 South Australia has the lowest annual average rainfall in Australia , and is comparable to some of the driest countries in the world. A pipe is a tubular section or hollow cylinder, usually but not necessarily of circular cross-section, used mainly to convey substances which can flow – liquids and gases (fluids), slurries, powders, masses of small solids. It can also be used for structural applications; hollow pipe is far stronger per unit weight than solid members. Pipes are made in many materials including ceramic, fiberglass, many metals, concrete and plastic. In the past wood and lead (Latin plumbum, from which we get the word plumbing) were commonly used. Pipe may be made from concrete or ceramic, usually for low-pressure applications such as gravity flow or drainage. Reinforced concrete can be used for large-diameter concrete pipes. This pipe material can be used in many types of construction, and is often used in the gravity-flow transport of storm water. Usually such pipes will have a receiving bell or a stepped fitting, with various sealing methods applied at installation. Smart Fabrication has been involved in water infrastructure projects for around a decade now. In addition to this experience, Smart Fabrication is further equipped forwater infrastructure contracts with our new 30,000 square metre site. Of this, 6,000 square metres are undercover, and this comprises 5 workshops. All of our projects adhere to rigorous ISO-9001 quality standards, and we are working towards achieving ISO-3834 welding standards in the next 12 months. Our medium term plan also includes ISO Environmental standards and Occupational Health & Safety Standards. All of this is part of our culture of continuous improvement, ensuring that all work is carried out the highest quality standards. Smart Fabrication is also well situated. At the new site in Port Adelaide we now have access to five slipways and around 150 metres of water frontage. Together, all of these factors ensure that Smart Fabrication is willing and able to take on any water infrastructure project that comes our way.